"TOP OF THE ROCK WILDLIFE SANCTUARY"
ANY Amount Donated Is Genuinely Appreciated. The Animals You Are Helping are RIGHT HERE WHERE YOUR DONATION IS GOING. Every Single Dollar Donated Counts. Top Of The Rock - National Wildlife Humane Society. You may use your Paypal account, which also includes Visa, Mastercard, American Express, Discover, or you may elect to use an eCheck. 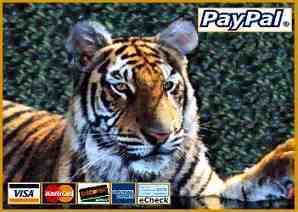 THE PAYPAL SITE IS SECURED, TO PROTECT YOUR PERSONAL INFORMATION, AND FINANCIAL TRANSACTIONS. You can use your PayPal account or any major credit cards, by clicking the buttons below for a single donation, or a recurring monthly subscription donation. NWHS and Top Of The Rock! Have something you don't need that we might can use? Or, you would like to donate something other than money? You may have just what we need!! Tell Friends About Top Of The Rock!